If you’re a hunter, bird watcher, target shooter, or participant in any other activity wherein enhanced vision is required, a spotting scope is a fantastic investment. Spotting scopes are designed to be used with a tripod, and are less portable than a pair of binoculars. However, they offer the best magnification and clarity of any type of sporting optic, making them ideal for spotting animals from long distances away. This article will cover what to look for when making an investment in a spotting scope, as well as help you choose the best scope for your needs. It is incredibly difficult to name a single spotting scope as the best available. But if you’re looking for a general use scope that can be used for a variety of activities, has good features, and is priced within the realm of reason for most outdoorsmen, you should really consider the Upland Optics Perception HD. A 20-60x60mm scope, it has the ideal amount of magnification for spotting, and the large objective lens lets in plenty of light without being excessively heavy. Its extra low dispersion glass gives it unbeatable image quality that you won’t get with very many other scopes, especially in that price range. We’re slightly biased because Upland is a partner company, but we honestly feel like they are the company to beat in the sporting optics world right now. This 80 mm scope is a straight scope design that is perfect for hunting in the great outdoors. The scope features high density glass and a fully multi-coated lens to produce a razor sharp image. A rotating tripod ring gives the hunter some much appreciated positioning flexibility. With a close focus of 16 feet, wildlife near or far can be viewed with great results. The aluminum alloy body is a lightweight, sturdy solution for trekking through the woods, and the scope is coated with a Swaroclean Coating for extra protection from the elements. This water and fogproof scope also features a sunshade to help reduce the glare and shield the objective lens. With this model, the eyepiece is sold separately. You can buy it here. This angled spotting scope comes in at 85 mm. It has a close focus of 16 feet and produces crisp enhanced images through its sophisticated triplet apochromatic lens system. The compact, lightweight magnesium alloy body is equipped with an adjustable eyecup as well as a duel focus feature that allows for fine adjustments to image clarity. The Vortex Razor spotting scope is coated with an ArmorTek Lens Coating to repel oil from the lens. The scope is a model that has been weatherproofed against rain, snow, and fog, so any hunting expedition can face the challenges of the environment. 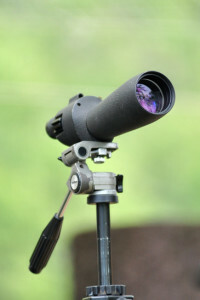 A 20x – 60x magnification eyepiece is included with the purchase of this spotting scope as well as a rotating tripod ring to allow for more flexibility when positioning the scope. Get more information by clicking here. Mentioned above as our overall favorite spotting scope, hunting is where the Perception HD really shines. Upland is a company that focuses exclusively on hunters, and this scope is a fine example of that. Weighing just 2.2 pounds, you can actually carry this scope with you into the field if you wanted to instead of just leaving it in the truck at the base of the hill. Should anything happen to it on your adventures, it is covered by a lifetime warranty. And perhaps most appealing to many hunters is its price, which rings in literally thousands of dollars cheaper than options from other top brands. See its price here. When target shooting is involved, the distance that needs magnification tends to vary. Rain may not be an issue to contend with in this scenario, but it is important to remember that other atmospheric conditions such as humidity, air turbulence, and dust can affect the performance of the spotting scope being used. A few of the more dependable spotting scopes for target shooting are listed below. The Minox is a short, extremely sturdy straight body designed scope that comes with an eyepiece magnification of 16x – 30x. This scope is great for shooting targets in the magnification range without sacrificing the quality of the viewing field. The optics are sealed with O-rings to keep moisture, dust, and debris from affecting the scope. An adjustable eyecup and a rotating tripod ring allow for greater range of view flexibility, which can be beneficial when target shooting. With a close focus of about 16 feet, this light weight scope is great for viewing short distances. Get it here. The Swarovski ATX is a high powered angled scope that uses cutting edge lens technology to take the viewer to their spotting destination. The 30x – 70x magnification range will define a razor sharp image anywhere within the range that is free of distortion. The focus wheel and the zoom wheel are within easy reach to allow for a quick zoom in that requires little adjustment. The high density, fully multi-coated lens produces a brilliant optical image, even in low light quality situations. This scope is a bit on the heavy side, but the rotating tripod ring minimizes the need to move the scope once it is positioned. Find out more by clicking here. The Kowa TSN is a spotting scope that is perfect for birding because of the lens and optical features that are included. The dual focus, fluorite crystal lens provides superb images with enhanced features, such as color, contrast, and resolution. The fully multi-coated lens and the porro prism allows for a viewing experience that has exquisite light intake, even in low light settings. Viewing birds at long distances results in a sharp, undistorted image, and higher magnification levels maintain an impeccable image quality. A lens of this quality is a bit heavy, so the body of the scope is made of a corrosion resistant, magnesium alloy material to help offset the weight. Eyepieces for this model are sold separately, but the design includes a locking mechanism to lock the removable eyepiece in place. See its price on Amazon. The Leica Televid APO is an excellent angled spotting scope for bird watching. Compared to previous models, this scope has a six percent light yield increase that makes the image resolution even more distinct in any lighting. The fluoride glass brings vibrant color and detailed contrast to the table without sacrificing any of the range of view. This scope comes with a fog and water proof seal as well as a AquaDura Lens Coating that will repel water and moisture. These protective layers assure that quality images are not obscured by dirt or fingerprints. The 12 feet close focus on this spotting scope is designed for bird watching. An avid bird watcher can use this scope to identify a bird from as close as the other side of a lawn to as far as the other side of a lake. Snag one by clicking here. The Minox MD is a great lightweight, compact spotting scope for anyone that will be traveling a lot, viewing different types of wildlife in a variety of areas. The porro prism and the fully multi-coated lens offers a view that has great color and clarity. The close focus is a bit larger than some photographers might like, but if is exceptional for securing considerable detail during those long range picture shoots. The sturdy metal exterior is fitted with a rubber armoring that provides a secure non-slip surface, which is perfect for climbing a mountain with a lot of jagged rocks that could cause damage to the lens. The scope comes with a 16x – 30x eyepiece as well as weatherproof features that will protect the scope from inclement weather patterns that could be encountered. Get more information by clicking here. Another great compact scope for those on the go is the Bushnell Legend in 12-36x50mm. This scope is a lightweight instrument perfect for hiking and other modes of travel. The fully multi-coated lens and the extra low dispersion glass give the scope a high-quality image with excellent light transmission. Make sure the image is pristine with the dual focus feature. Unfavorable weather is not a threat for the weatherproof protection. Follow this link for more. The Vortex Razor HD exceeds the quality levels of many spotting scopes that wear a heftier price tag. The top of the line lens features and high density glass that is implemented in this spotting scope will produce impeccable images that are free of any imperfections. The high resolution and astounding sharpness can be seen throughout the entire field of view, it is even evident at full magnification. The angled body scope has a close focus of 11 feet, so wildlife that is nearby can be viewed without difficulty. In addition, a 16x – 48x magnification eyepiece is included with the purchase of the Vortex Razor. This specific spotting scope is protected from most atmospheric conditions, including: rain, fog, snow, wind, and humid conditions. The protective layers also safeguard against dust, debris, and unwanted fingerprints. This link will show you the price. The Celestron Regal M2 is another great buy. This spotting scope produces exceptional images without distortion. The extra low dispersion glass enhances the image with a crisp resolution as well as vibrant colors. The edges of the viewing area are never out of focus, even at increased magnifications. Fine adjustments can be made with the dual focus feature. This light weight scope has a magnesium alloy body that will help prevent corrosion, and the optics are fully protected from the elements. A 16x – 48x magnification removable eyepiece is included with the purchase of the Celestron Regal M2 as well as a photo adapter that helps get the scope ready for “digiscoping” in the great outdoors. The scope is also equipped with a rotating tripod ring for greater flexibility while viewing and a sunshade to reduce the glare on the pictures taken. Click here to buy one. The Redfield Rampage is a great selection for anyone that is looking for a spotting scope that is in a low price range. In addition to a 20x – 60x magnification range, this spotting scope offers many features that are commonly seen in more expensive models. This lightweight scope will give you a clear image, especially at the mid range magnification levels. The fully multi-coated lens increases light transmission, giving the viewer a sharper image. The Redfield Rampage is designed to be rugged; therefore, the scope features weatherproof qualities to protect it from the rain and fog. Find out more here. Another great spotting scope under $200 is the Barska. This spotting scope features a straight body model that has a high magnification range of 30x – 90x, which is exceptional for this class of spotting scope. A fully coated porro prism helps increase the optics, giving the viewer a bright, high quality image. The Barka maintains noteworthy image quality and clarity in low light situations and at higher magnification levels. You can snag one at Amazon. Mid-ranged spotting scopes can still exhibit exceptional features. After some careful consideration, here are some great selections that are below the $500 price point. The Vortex Diamondback is an excellent mid-ranged spotting scope. The great value is matched by a great performance that has a reputation for being on par with spotting scopes that cost twice as much. The fully multi-coated lens is coupled with a dielectric prism coating that optimizes light transmission, which gives the viewer an image that stays true to the bright colors seen in nature. The classic straight body design also features fog and water resistant seals that will protect the scope from any moisture or debris. The Vortex Diamondback is a very sturdy scope that is great for “digiscoping”, and a sunshade is included to help reduce the glare in the field of view. Click here for more info. A spotting scope that has a reputation for a top of the line product at a reasonable price is the Vanguard Endeavor. Vivid colors and sharp details are the result of an extra low dispersion glass and a fully multi-coated lens. This scope features a close focus of 14 feet and a magnification range of 15x – 45x that produces picture perfect images that are not distorted in any way. Small adjustments can be made with the dual focus feature. This scope design also features weatherproofing as well as rubber armoring that are meant to protect the scope from damage. The Vanguard Endeavor is a scope that has an extended eye relief for a more comfortable observation in the impressive field of view. Buy one by going here. The Vortex Viper is an angled body HD spotting scope that sports all of the top of the line features that are often seen in high end scopes for a fraction of the price. The optics on the Vortex Viper produce exceptional high resolution images that remain vivid in color and contrast. The lightweight design also features a rotating tripod ring and an adjustable eyecup for more comfortable viewing as well as a dual focus feature that allows coarse and fine adjustments to the image. The design is waterproof and fogproof with some added protection to keep any oil and debris from the lens. This model does include a 20x – 60x magnification eyepiece, which makes the overall value even better. You can find this scope here. The Pentax PF ED is a popular straight body spotting scope that offers extremely high performance at an affordable price. The lightweight scope has a magnesium alloy body that is easily portable for the spotter on the go. The extra low dispersion glass and the fully multi-coated lens give the scope an optical excellence that is often seen in high end scopes. This model includes a 20x – 60x magnification lens that combined with a sunshade to reduce glare. Images that are fully magnified maintain the clarity and the vibrant detail that would be seen at a low magnification. This scope can also be fitted to a variety of astronomical eyepieces that creates possibilities for the spotter to have a view into the galaxy. Click on this link for more information. Spotting scopes are used for many different reasons, but a rule of thumb is that they are used when magnification greater than what a pair of binoculars provide is needed. These types of scopes are often used for hunting, archery, birding, and spotting wildlife. They can also be used to magnify a beautiful scenic mountain range. A spotting scope can be attached to a camera to take a long ranged picture of a majestic animal without disturbing them or putting yourself in danger. Some people who use a spotting scope use them in conjunction with guns. This allows the person that is hunting to get a better view of the actual target before taking a shot that could miss and potentially spook the animal. Spotting scopes are also used during target shooting, which makes it easier to see if the target is hit at greater distances without needing to close in on the target. There are two types of spotting scopes, an angled body and a straight body scope. Both work well in most situations, but one may be preferred over the other in certain viewing circumstances. An angled body scope is great for when you are looking either up at your target or across flat ground. This type of scope is also perfect for viewing from the window of a vehicle. A straight body scope is best for viewing from a higher position, such as during a hike on a mountain to catch a glimpse down into the valley below. The absolute best option for a spotting scope is a high quality objective lens that is comprised of high performance glass. Always go for lens quality over size if you have to choose, as a larger lens of poor quality will result in a mediocre view when compared to a smaller lens of optimal quality. A larger lens will always produce a superior image at higher magnifications than a smaller lens of the same quality. Objective lens size can make a massive difference in price, expect to pay more for a larger scope. The magnification of a spotting scope is designed to allow for viewing at the distance where conventional binoculars no longer function. Most observation done with a spotting scope requires a magnification of 30x – 40x, which assures that most scopes are capable of producing reasonable images. As the lens quality goes up, the quality of the image increases as well. A bit of quality will always be lost at higher magnifications, but a higher quality scope will reduce the image drop-off quality. The atmosphere also plays a big factor in the quality of the image being viewed. Humidity, glare, wind, and dust can all lower the quality of the image. High altitudes that have a dry climate are bound to produce higher quality images at high magnifications. Low altitude areas that are wet and humid may require a low magnification for a clear image. Many spotting scopes do not go higher than 60x due to the limitations set by the atmosphere for magnified viewing in the daylight. Lens coating is an important feature of a spotting scope, especially for viewing images at high magnifications. The lens can be fully coated, multi-coated, or fully multi-coated. Each lens coating improves the light transmitting into the lens, but the quality received depends on the coating chosen for the specific scope. Premium spotting scopes all tend to be fully multi-coated to produce the optimal viewing experience. Eye relief is the distance away from the scope the viewer’s eye can be from the eyepiece without losing any of the field of view. This feature is especially needed for people who wear glasses. With a big enough eye relief, even people who wear glasses with thick lenses will be able to see the full image without any issue. For those who require glasses to see, it is recommended to have at least 14mm of eye relief on a spotting scope. Most spotting scopes are refractors that use prisms inside the scope to flip the image right side up and left to right. There are two different types of prisms that are used in spotting scopes, a roof prism or a porro prism. The roof prism spotting scope is slim and compact, but it tends to lack some key features like interchangeable eyepieces. It is an extremely portable scope that is perfect for someone who is always on the go. The porro prism spotting scope is the most efficient and the least expensive prism to produce, which makes it the most common. When purchasing a spotting scope, be aware that sometimes the eyepiece is not included in the price of the scope. If the eyepiece is included in the price, the eyepiece may not be removable. Higher end spotting scopes have removable eyepieces that often do not come included with the price of the scope, to give the buyer a chance to choose from the different options available. A single powered eyepiece has some optical advantages, but most people that use spotting scopes prefer the convenience of a zoom eyepiece. With this type of eyepiece, the magnification can be changed easily in a situation where the atmospheric conditions are not stable. A zoom eyepiece that is high quality will have a great eye relief as well as produce exceptional quality images. A close focus is the nearest distance a spotting scope can view. Most spotting scopes do not have a close focus of less than 20 feet, so make sure image being viewed is an adequate distance away. This feature is perfect for viewing birds and seeing miniscule details on their feathers. Waterproofing and fogproofing are not absolute necessities, but they are a feature that protects the spotting scope from atmospheric conditions that may occur. The seals that are produced to keep moisture out will also keep dust and debris from the scope, which will keep the spotting scope in good condition for a longer period of time. Due to the magnification levels of a spotting scope, a tripod or some support is needed to keep it steady during the viewing process. A car mount works well if viewing from a vehicle, but in most situations a tripod is required. All spotting scopes are threaded like a traditional camera, so there is no need for a specialized tripod. The tripod needs to support the scope, so if the spotting scope is heavy, the tripod needs to be heavy as well. For anyone using a spotting scope while hiking or traveling, make sure to consider the weight of the scope and the tripod before you commit to a long haul. You can read our guide to the best tripods for spotting scopes to get some ideas for great tripods to use with your new optic. Most spotting scopes can adapt to a camera to take long distance pictures. This process is often referred to as “digiscoping”. Make sure the scope and camera are compatible to assure a great picture from the mountain top. To properly “digiscope”, specific adaptors may be required for the camera to produce vibrant, razor sharp images that are of exceptional quality. There are a lot of different spotting scopes available on the market today, but not all scopes are created equally. This article was designed to introduce someone who is new to birding or other recreational activities where a spotting scope is useful to the different features that are available. Once a spotter is sure of the magnification they need, it comes down to knowing the price restraints for purchasing the scope and determining which extra features should be included with the spotting scope. If “digiscoping” is an ambition, make sure the spotting scope that is selected can accommodate this desire. Hopefully, this article will help a new spotter determine which scope is best suited for them. Make sure to consider the suggestions made above, but also do additional research so that the spotting scope decided upon lasts generations to come.